Ororo Munro, aka Storm, is caught in a whirlwind of trouble. Storm #7 jumps straight into the consequences of Storm's actions from the previous issue, where she saved a plane of VIPs. Having been set up by the nefarious Eaglestar corporation, Storm was physically spent as she carried the broken plane back to safety, collapsing shortly after landing the craft. The tension has been ramped up, with Storm's enemies closing in on her. Her past actions have made her a target and now branded her a public enemy. With the current issue, writer Greg Pak is showing readers that he can carry an ongoing arc with the same emotional weight and dynamic storytelling as the earlier stand-alone issues in this series. Truth be told, it is a strong series, a model of what a solo series for an X-Men character should be like. This issue has lifted my already raised hopes from the previous issue. 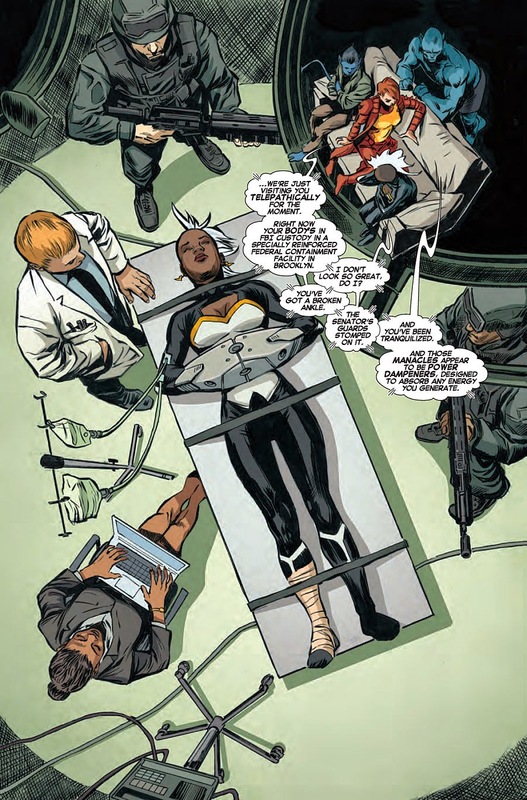 As mentioned in the review for Storm #6, I anticipated that the story was developing across issues, with the setup issue being a wait-and-see. Well, we have done just that, and we weren't disappointed. The creative team has hit its mark in issue #7. In this issue, Pak enlarges the supporting character base, drawing on the staff from the Jean Grey School to help Storm in her plight. What is also great to see is the bridging of earlier issues from the series with a full page dedicated to glimpses of characters from issues 1–4. Pak's style in bringing out the story has been methodical and deliberate. The pace has been building steadily but is punctuated with anticipation at the end of each issue. The art by Al Barrionuevo and Tom Palmer feels as though it has matured in this issue compared to the last. The line style is tighter, magnified by more focused inking from Palmer. The cleaner lines allow a smoother reading experience. Barrionuevo's depiction of the supporting X-Men characters—Rachel Grey, Beats, and Nightcrawler—are great. 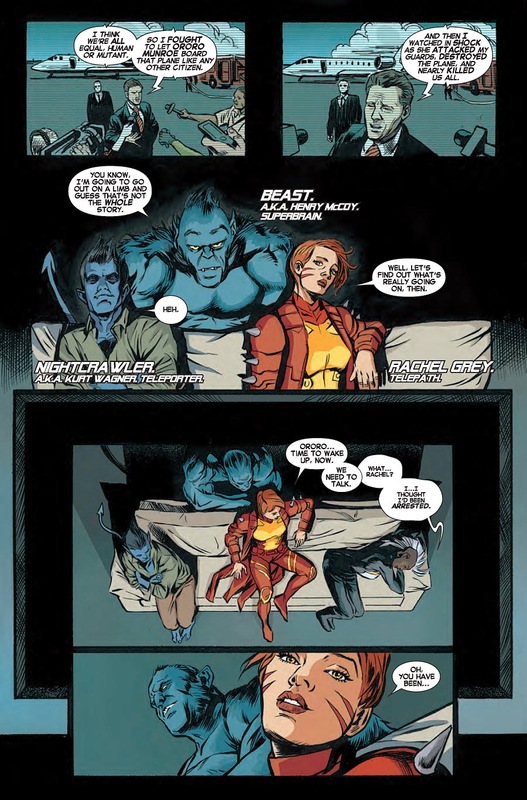 Rachel is full of relaxed confidence, Nightcrawler is mischievous looking and even a little proud, and Beast remains fraternally concerned yet supportive of Storm's rogue actions. The choice of shots is a lot more varied in Storm #7. This is a lift from the previous issue, and we see a lot more panel work, which is a direct result of the new setting for this issue. The confidence of the artists is refreshing. Ruth Redmond's colors are the stalwart of the artistic team. The colors enhance the pages with subtlety, yet are dramatic when called for, such as when representing Storm's ferocious powers. Redmond's consistency in this series provides a great ongoing sense of familiarity; however, if a new reader to the series were to pick up any issue, the colors would feel as natural to the series as Pak's writing and dialogue are. 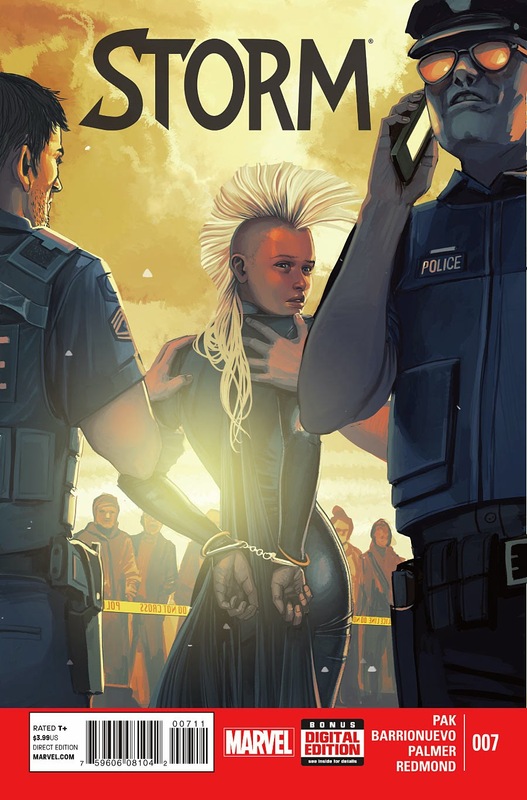 It is coincidental that at this point a social media campaign is running to #SaveStorm when in this issue the best person to do this is the character herself. As a series and character Storm has the ability to reach out to others and lift them up, and more awareness can bring this campaign to a positive conclusion. I highly recommend this series, and if you want to help #SaveStorm, see your local comic book shop today. We want to hear what you thought of this issue, Fanboys and Fangirls, so leave us a comment below. Do you like this ongoing solo series, or do you prefer to see Storm in the other team X-Men books? What do you think of the artistic team on Storm? Hit us up with your thoughts, or head over to Twitter or Facebook and leave your mark there.